Can’t decide whether you want to go camping or boating? Now you don’t have to. I’ve often wondered why no one has built a boat like Southbeach’s Vacationer 240 before. Imagine a campervan that’s also a boat and you’ve got it in one. It can be set up in a caravan park much as people do with campervans. Or it can do something campervans can’t, go boating. It can be a day boat or, with appropriate options, a weekender. The Vacationer 240 is a ‘bitzer’. It’s a bit of a pontoon boat in terms of interior space and fit out. Yet is much easier to tow and launch, and a much more conventional boat on the water. It’s a bit of a small cruiser. But it has more interior space than other small cruisers and a unique full-length hard-top (raised while aboard and lowered for trailering and storage), with a patented electronically operated mechanism. Our blue ribbon boatbuilders, such as Whittley, Haines Hunter, CruiseCraft and Haines Signature, base their small cruisers around conventional ‘deep-vee’ hulls, while Southbeach’s hull goes a different route. The Vacationer 240’s bow is ‘squarish’, and a quite shallow deadrise at the bow works its way back in a series of compound curves to become a ‘fattish’, multiple deadrise, cathedral-style hull towards the transom. The effect is excellent at-rest stability and generous interior space, albeit in a hull more suited to enclosed bays, estuaries and lakes than open waters. That covers many of Australia’s premium boating locales, where this boat introduces new standards of comfort and amenity to social and family boating. A massive lounge in the bow, with plenty of room for six adults, converts to dining with the addition of a large table. It can also be a double bunk, with infill. The helm is positioned in a side console halfway along the starboard side opposite a galley featuring a double burner gas stove and sink with a spacious pantry underneath. Aft there’s another huge lounge/dinette, which could easily seat another six adults. The centre area is clear space. Officially, our test boat (a sterndrive model powered by a 1.7L turbo diesel MerCruiser driving through an Alpha leg) is rated up to 10 adults, while the outboard-powered Vacationer 240 is rated for 12. Most owners would probably be happy with two or three couples, and maybe a little person or two. These passenger numbers are realistic; there’s certainly heaps of room. The aft lounge’s centre section hinges up to reveal a portable toilet. Fitting the privacy screen takes mere seconds. A shower is optional here, and the sterndrive model can be fitted with a heat exchanger type hot water system. A 60L freshwater tank comes standard with a second 60L optional. Fuel capacity is 130L. Storage is never oversupplied in any boat, but the Southbeach gives it a shake. There’s a long underfloor well along the cockpit and lined stowage space beneath both aft and bow lounge areas. The pantry area includes a certified gas bottle locker and the aft stowage space incorporates an icebox in one side. Waeco refrigeration is optional instead of the (standard) icebox. Which can be matched with another one in the port side locker. The sterndrive version tested also had an external locker on the stern. Steps over the aft bulkhead make it easy to move out onto a big swim platform above the sterndrive, this is divided by a motor well in the outboard version. There’s a flip-down extension ladder for boarding. During the test we had to load passengers and gear from a flat beach and had no trouble pulling the stern into calf-deep water with the sterndrive leg tilted up. With six on board I was surprised how well the little diesel handled quite a lot of boat for 120hp. Those horses can move. They lifted us onto the plane in short order. Thanks to hydraulic steering, handling the Vacationer is effortless and (for a campervan) it’s surprisingly responsive to being tossed around. The sterndrive boat tested was set up as a day boat with just the hardtop and no camper curtains. An outboard version I saw was optioned with full camper covers. These exhibit more of the smart thinking evident throughout this unusual boat. There’s an overhanging section each side and another on the stern to shelter the windows so they can be left open for ventilation, even if it’s raining heavily. Inside zip-up curtains ensure privacy at night, and everything is insect screened. The double-skinned hardtop is foam filled and the insulation keeps the boat pleasantly cool inside. There’s plenty of ventilation, and yet those biting insect pests that can plague boating are kept away. If you are intending to use this boat as a campervan sometimes, a moulded travel pod mounted across the front of the trailer is an option worth having, if only to stow a set of (optional) stairs to board from the ground while the boat’s on its trailer. You can also consider 240V power as an option. And while a sound system is standard, for quiet evenings you could consider the flat screen TV/DVD player mounted in the roof of the ‘camping’ version I saw. Yes, these are all options, though some would be harder to do without than others if you were using this boat as a combination camper boat and campervan. Unlike many imports, the Southbeach Vacationer 240 is legally trailerable on Australian roads. Many imports are over width and require a permit to tow, though this is not widely publicised. A towing weight of 2.3t for the outboard and 2.4t for the sterndrive Vacationer 240 means you can tow them with mid-sized 4WDs such as Pajeros and Prados. 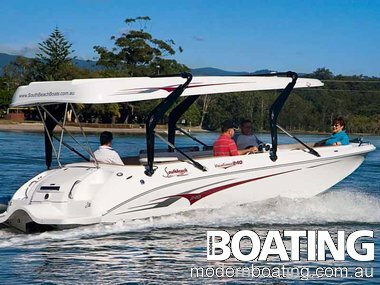 This boat adds an altogether new and exciting aspect to the Australian outdoor experience. We’re sure to see lots of them on the water, on the road, and maybe even in camp sites, in the future.